Kogan's da Vini 1.0 3D printer. A total of 26,800 3D printers were shipped globally in the first quarter of calendar 2014, and while enterprises still represent the majority of customers, the consumer sector is gaining traction, according to Canalys. The analyst firm claims 46 per cent of 3D printers sold in the three months from January to March were acquired by consumers, up from 43 per cent for full-year 2013. “While enterprise engagement will continue to grow, it looks to be the consumer space that will drive shipments in the near future,” Canalys senior analyst, Tim Shepherd, said. Canalys estimates that 67 per cent of 3D printers shipped in the first quarter were priced under $US10,000 before tax. It also said it is seeing sub-$US1000 units coming to market, while crowd-funding projects promise sub-$500 prices. 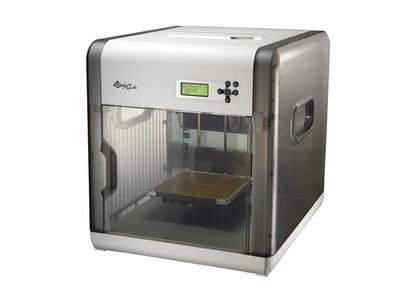 For example, Australian online retailer, Kogan.com, unveiled in May it would sell its own 3D printer, the da Vinci 1.0, for $A699; the XYZprinting-manufactured product is openly available to the public. Kogan’s RRP marked a significant price drop from Officeworks’ $1499 3D Systems Cube, which was launched in January as the first 3D printer available in the Australian retail market. Canalys claims that crowdfunding is partially responsible for 3D printers’ traction in the consumer space. ‘The sheer number of ultra-low-cost printers, typically from innovative and aspiring start-up companies, which are finding investment through crowdfunding sites, such as Kickstarter and Indiegogo, is impressive,” Shepherd said. At the opposite end of the market, premium industrial-grade printers priced over $US100,000 represent one per cent of unit shipments. Vendors targeting these customers sell a small number of printers per year, but with price points for some high-end units at over $US1 million, substantial revenue exists.